PROVIDENCE — Last month, the Department of Health gave the go-ahead for the opening of three medical marijuana dispensaries that were authorized in large part to give patients a safer and more accessible way to obtain what the federal government still classifies as an illegal substance. 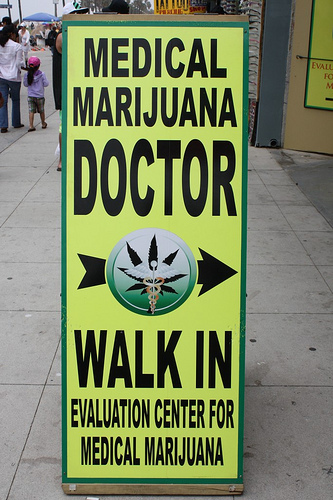 But the opening of the dispensaries may not necessarily make it easier for patients to get marijuana. Thanks to a law enacted by the General Assembly in the waning days of last year’s session, most information about the medical-marijuana program, including the names of doctors who certify patients for marijuana-use cards, is now secret. As a result, patients who want to obtain medical-marijuana are depending on word of mouth to find a doctor in Rhode Island who’s willing to certify their need. “They’re not going to be able to find them in the Yellow Pages, that’s for sure,” says Steven R. DeToy, spokesman for the Rhode Island Medical Society. There are currently 465 doctors who have certified 3,351 patients for the five-year-old medical-marijuana program but, since the Health Department and the Medical Society are prohibited from making referrals, they’re telling patients to go to the Rhode Island Patient Advocacy Coalition (RIPAC), the support group for medical-marijuana patients. But RIPAC doesn’t give out doctors’ names to people who come to the group. The 2010 change in the law that now makes it illegal — punishable by up to 180 days in prison and a $1,000 fine — for any government official to disclose marijuana doctors’ names was supported by some of the state’s most passionate open-government advocates: Sen. Rhoda E. Perry, D-Providence; Rep. Edith Ajello, D-Providence; and the Rhode Island Affiliate of the American Civil Liberties Union. “The original intent of the law [that took effect in 2006] was that physicians would receive the same degree of confidentiality as they would when prescribing any other kind of medicine for any other type of patients,” Perry explained in a recent interview. But not every lawyer who read the law felt the confidentiality provisions were all that clear. Early last spring, when a reporter for The Providence Journal asked the Health Department for the names of all physicians who’d certified patients for medical marijuana — and the number of patients each had certified — Bruce McIntyre, a veteran legal counsel for the department, decided that while the law clearly made patient and caregiver names confidential, it did not do the same for names of the doctors. So last March, the department released the names of the 355 doctors who’d at that point signed certifications. The reporter began calling some of the doctors. A front-page story was published. Listed in the story were the names of 21 doctors who’d certified at least 10 of their patients. An uproar ensued. Doctors started calling the Medical Society, the Health Department and Perry to complain. The ACLU, the Medical Society, the Rhode Island State Nurses Association and RIPAC wrote a joint letter to Dr. David Gifford, then-director of the Health Department, excoriating the department’s release of the doctors’ names. But in reply, McIntyre said the “protected list” only applied to patients and their caregivers. If there was an interest in protecting the confidentiality of physicians as well, the law needed to be amended and the Health Department would support the change, he wrote. An amendment to the law was quickly drafted and in rapid-fire fashion passed both chambers and became law last June — without then-Gov. Donald Carcieri’s signature. It makes clear that any information about specific medical-marijuana patients, their doctors and caregivers were exempt from disclosure under the state’s public records act. “It had a really chilling effect,” Perry said of publication of the physicians’ names. One doctor whose name was published because he’d certified 100 patients isn’t approving anyone for the program anymore. He’s put up a large sign in his office announcing this to his patients. Annemarie Beardsworth, spokeswoman for the Health Department, said some doctors were upset at the publication of their names “because they do not want to be viewed as ‘pot docs.’ I think some are also aware that there are some very opposing opinions about the medical-marijuana program. I think if you look at the entire patient population, there are probably some patients in your practice opposed to medical marijuana.” Doctors, Beardsworth said, don’t want to perhaps “risk losing those patients” who are opposed to medical marijuana. Handel said there are other reasons physicians were upset over the publication of their names: fear that the federal government would take action against their licenses or their medical-malpractice insurance would be canceled if an insurer found out they were certifying patients to use marijuana. “It’s difficult to assess patient risk” for medical-marijuana because unlike other controlled substances, you don’t prescribe dosage or have any way of monitoring patient use or misuse of the drug, Handel said in an interview. He says he’s made it clear to RIPAC that he doesn’t want any referrals. Rhode Island is among several states that make the doctors’ names secret. But in California, doctors who approve patients for medical marijuana are falling over each other advertising their services –– in storefronts, fliers and over the Internet. Previous articleMM Patient gets LIFE IN PRISON for Medicine Use! I believe this is a serious issue and think the best tactic is to allow the doctor’s to disclose their own information if they feel comfortable. Some doctors may want people to know that they offer these services and others may not. Keeping it confidential may be better for some while others may want patients to know where they can go for the relief they need. This seems to be a touchy subject that certainly needs some serious deliberation before a proper decision can be made. The problem also lies in whether or not those doctors who do advertise to patients handle their practice responsibly and don’t hand them out like free candy. definitely a delicate matter. We want the doctors to feel comfortable helping ?who need it but at what cost? So confusing…. DO we want doctors to come out or not?